PiCK-ME-UPs: Empower yourself, enjoy life! of contents, plus a few chapters. Most people begin the day with a cup of coffee (anyone out there still drink tea in the morning?). Well, how about a spiritual pick-up to give tone and direction to the day? And now for some excerpts to pick you up and make you pick up the phone to order. HIGHER PLEASURES: Really, we were made for pleasure. So, why do we suffer? Our hidden potential demands that we become greater people – people who can appreciate and enjoy the higher, heavenly pleasures that await us. To become such people we must pay a price – in exertion, stress and pain. NO RESPONSE: Not to return a greeting – to ignore the one who says hello – is a form of theft (Brochos 6b). Seemingly, then, when we greet others, we lay an obstacle before them. For if they don’t return our greeting, they steal. One solution is… smile. This way, they may treat it as our greeting or not. Our smile can simply be a sign of the pleasure we take from seeing them. FAVORS OR ORDERS: What is better, asking for a favor or giving orders? Asking for a favor every time. For the other person, it preserves his dignity. For us, it produces superior results. HIS NEXT SUCCESS: To tell a pauper that he is a king is to make fun of him. but to show a pauper, with our words and actions, that he is the best pauper we know, is to point him towards his next success. INSTEAD OF WAITING: Instead of waiting for wonderful things to happen to us, we need to focus on being wonderful people – then wonderful things will happen to us.. Ever hear something really thought provoking and say, “Hey, yeah, that’s so true. I need to write that down!”? Well, this is a book full of those kinds of axioms. 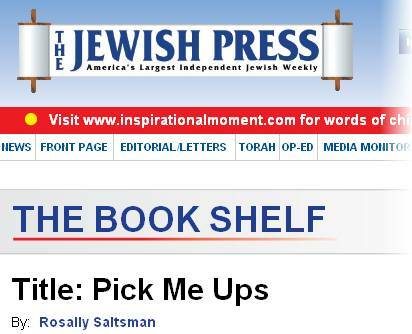 Pick me Ups is the tenth book in prolific author Rabbi Avraham Tzvi Schwartz’s series of books to uplift and inspire. Part self-help, part self-actualization, Pick Me Ups is a collection of short pithy sayings perfectly attuned to a world in which people are short in time and attention yet big on goals and aspirations. Focusing on self-improvement from the inside out, the book is divided into sections, among them: Happiness, love, wealth and self-improvement, the areas in our lives which are our top priorities but which we seldom devote enough time and energy to. These sayings are no clichés but powerful meditations which when focused on will enrich the reader’s inner life and by extension, outer world, taking those in his path along with him. Stemming from a daily newsletter that spans the globe, these transformational thoughts with the illumination of Torah and the lexicon of the self-improvement savvy, provide an oasis of introspection in a busy day that will nurture your mind, body and soul. These thought-provoking truths are both a level that we need to adopt and aspire to and reminders of what we can achieve in life. Succinct tidbits of inspiration which you can “pick-up” at any moment of the day when you need a bit of encouragement and motivation. Rabbi Schwartz radiates hope and positive energy through the deceptively simple yet deeply spiritual observations in his book. This is a powerful, and beautiful book, written by an inspiring author Avraham Schwartz packed with, life changing words, that will elevate and inspire you to a greater perception of life at a personal level and beyond. Use the sentences as a form of meditation they will move you on to higher levels of focus, energy, happiness, and success and to enjoy life at all levels , and enable you to have a greater perspective and love of your fellow man and the universe around us. This is the tenth book that I have read by this author, and his writings only gets better, and more inspiring, he really is a rare diamond in this universe. This is not a book to sit down and read in one sitting (although sometimes I find it hard to stop reading.) It's more a book to pick up before breakfast and read a paragraph or two or three. It may make you smile. It may seem unimportant. But I find what I read popping up in my mind throughout the day. Sometimes it helps me in a difficult situation. Sometimes I just recognize the truth and reality in what I read. And sometimes (and this is the best) it makes me stop and think and see all the good in the world and in my life, or in my life as I could make it be. Give this book to someone you care about as a way of caring. This is a book of Rabbi Schwartz's original meditations drawn from the breadth and depth of almost all areas of traditional Jewish literature - from both the revealed and mystical teachings. Each meditation is usually only two or three sentences - but power-packed! They are grouped into many different sections - each section dealing with an area of life that usually presents most people with deep challenges and struggles on the one hand and deep rewards, pleasure and holiness on the other. Each meditation is designed to target one aspect of each of these areas of life to help heal and strengthen that aspect of life. All of the meditations together can help us become more well-rounded people. I find each meditation to be extremely potent and effective. And I always feel more pure-hearted, broad-minded and stronger after being involved with Rabbi Schwartz's meditations. The “PiCK-ME-UPs”…have inspired, helped and/or simply made me smile. Amazingly, the “PiCK-ME-UPs” always seem to correspond to the situation that I am in at that particular moment. Luciana Ceross, Sevenoaks, Kent, U.K. I love your work. Succinct and power-packed thoughts that can last a lifetime! If you are having a rough moment or you feel empty inside, stop everything you are doing, sit quietly and read a few excerpts of “PiCK-ME-UPs”. Your spirit will be lifted and you will feel as if you were being fed fresh manna from heaven. You will not only be enlightened by his work, but you will feel his love and kindness in your heart when you need it most. Your explanation is so simple, yet on a high level. The “PiCK-ME-UPs” do that for me…I look forward to reading them on a daily basis. I see how the world needs people like you; when it’s dark, you bring the light.